The first day was mostly spent steaming to the first dredge site, about 14 hours away from Lewes, Delaware. In the morning, all of the safety information was covered and those of us who had not tried an exposure suit before put one on. After the ship reached the ocean, we did a test dredge to ensure that all of the equipment was working and that we all knew what to expect. 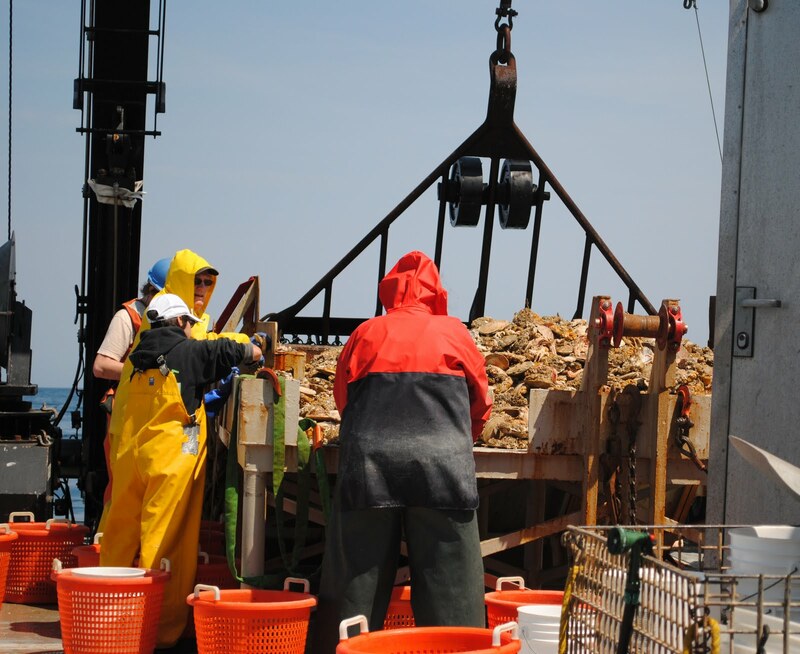 The process is basically the same for all dredges on the Sea Scallop survey. Each tow is at a specific, pre-selected random site, using the same type of dredge, at the same angle to the bottom for the same amount of time and at the same speed as all other tows. This ensures that the data gathered is comparable from tow to tow and particularly from year to year. Once the dredge is pulled back up, it is dumped onto a sorting table on the rear deck of the ship. Everything is sorted into 4 categories: scallops, fish and squid, sea habitat (which is anything that is not scallops or finfish), human trash. Once the initial sorting is done, the sea habitat is counted by the bucket-load and dumped back into the ocean; the fish are sorted by species and weighed and counted. Some species (skates, flounder/flukes, and goosefish, also called monkfish) are also measured for length. Scallops are weighed, counted and measured. Some specific samples may be kept for researchers on shore and the rest is thrown back. Human trash is kept aboard for proper disposal later. After all of the sorting and measuring is finished, the buckets are rinsed and stacked for the next dredge, which isn’t usually that long in coming. Fortunately, we are not measuring things with a tape measure or having to manually input lengths into the computer. The ship has 3 “fish boards” that are electronic magnetic measuring devices that automatically send the data to the shipboard computers. 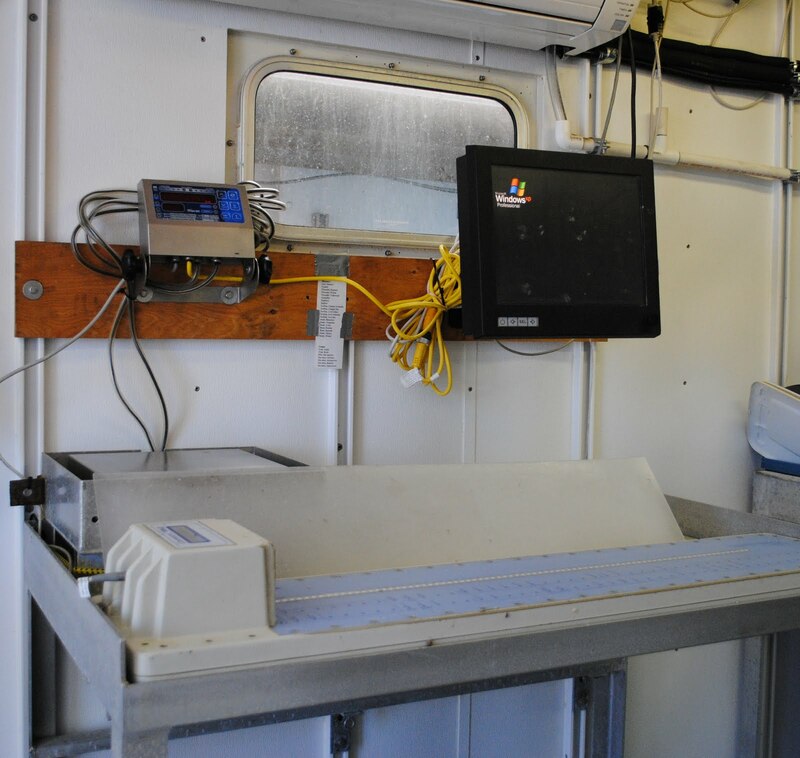 Operators choose the species of fish being measured and then each fish is put on the board and a magnetic wand is used to mark the end of the tail of the fish. Each length is sent to the computer and stored. Historically, the data was collected on paper and the lists sent to a prison to be hand entered into a database. The database then had to be proofread and corrected if necessary. While the data still must be audited, it is much faster and easier, and less prone to error, to take the hand written stage of data collection out of the process. We couldn’t have asked for better weather, clear and calm. After the safety meeting and test dredge, there was a great deal of down time until we reached the first site at about 10pm. I am on the day watch from noon to midnight and so got to sort the first real dredge. We did find scallops, ranging from about 1 inch across to about 5 inches across, but we found more sand dollars. After spending countless hours walking beaches to find even a few sand dollars, it was amazing to see hundreds or thousands on the sorting table to be tossed back as sea trash. I also discovered that you can easily loose track of time simply sitting in the sun on the deck watching the world go by.